We are maintaining a large stock of Decorative Wall Clock with unique features specially designed to give more elegant and nautical touch to any room in office and home as well. We offer the made from high quality of brass with stylish frame in center surrounded with classic Roman numerals. We provide this entire range at very reasonable prices. The product code for the item is 2217. We are supplier of the unique and stylish Digital Wall Clock made from high grade of metals. This piece of Nautical Wall Clock with flawless finish beautifies the living area and office area with its elegancy. Our customer can avail this piece of wall clock with product code 2274 at genuine prices. Our team of experts allows us to provide an exceptional range of Nautical Wall Clocks with unique features. This decorative piece of Wall Clock is the result of hard work of expertise team made up of high grade metals. The white base dial with dark black written numbers makes it easy to identify not only every hour even a single second. The product code for this is 2253. We offer a comprehensive range of Modern Wall Clock made from high grade of metals with product code 2258. This piece of Nautical Wall Clock gives an aesthetic beauty to the working and living area with its unique features. We provide the product at competitive prices to our customer. Our clients can procure from us an exceptional range of Alarm Wall Clocks with unique features. This piece of Nautical Wall Clock is specially made with lots of efforts to give an elegancy and an aesthetic beauty to the living and working area. The product code for this item is 2257. We offer this product at reasonable prices. Our range of stylish and unique Personalized Wall Clocks will beautifies the elegancy of the place where it is placed. 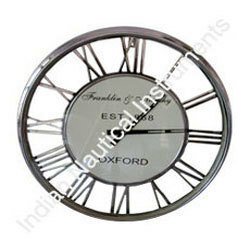 Our entire range of Nautical Wall Clock is made up of high quality of metals. This range of Nautical Wall Clock has sturdy and beautiful frame with unique finish, which extract the touch of antiquity. The product code for this item is 2201. We offer high quality of Antique Wall Clocks antique wall clock is an invention which is collected and kept for over 100 years and can be put in a solid structure of a building or house that can illustrate time. Also if you want some perfect explanation about the the item and want to purchased it someday, you can follow up some story here about the antique wall clocks. We are the manufacturer and supplier of an exceptional range of stylish and unique Chiming Wall Clocks embedded with various attractive features. The whole range of this Nautical Wall Clock will more beautifies the living or working area with its antique look. Our customer can avail this product from us with product code 2254. We offer this product at much reasonable prices.